The strangely slumping house across the street. I painted this out my studio window. 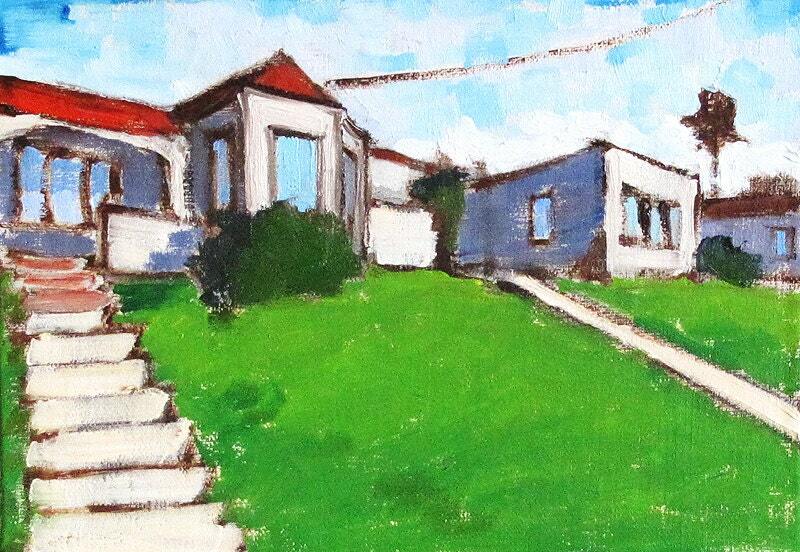 This entry was posted in Landscape Paintings, San Diego Paintings, Urban Landscapes and tagged 5 x 7 inches, architecture, barrio logan, historic, house, landscape, oil on linen on panel, san diego, sherman heights, spanish on August 6, 2013 by Kevin. 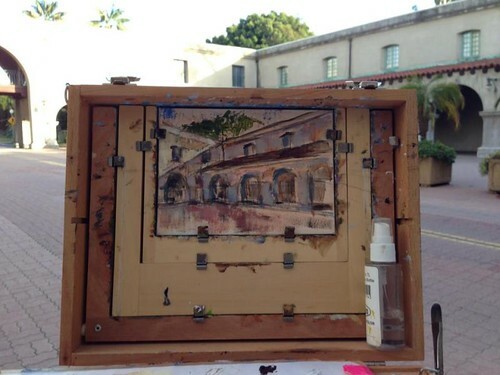 This is one of my favorite spots to paint in Balboa Park. 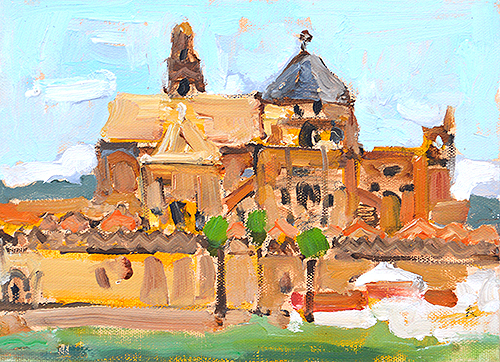 This entry was posted in Landscape Paintings, San Diego Paintings, Urban Landscapes and tagged 5 x 7 inches, alcazar garden, arches, balboa park, colonial, oil on linen on panel, san diego, spanish on August 4, 2013 by Kevin. University Heights, full of great old architecture. 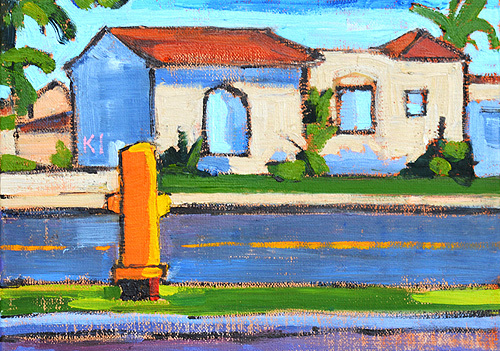 This entry was posted in Landscape Paintings, San Diego Paintings, Urban Landscapes and tagged 5 x 7 inches, architecture, bungalow, california, fire hydrant, fire plug, oil on linen on panel, san diego, spanish, university heights, yellow on July 20, 2013 by Kevin. I love all things New Orleans. (Yes, even the summer humidity.) 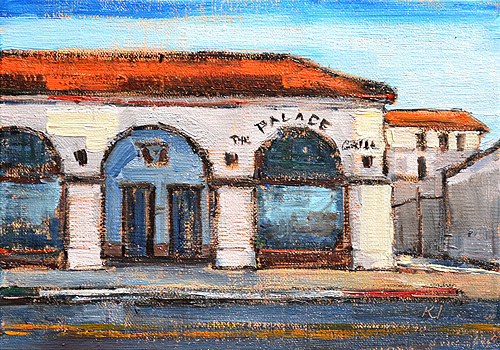 The Cajun food at Palace Grill is superb- hands down my favorite place to eat in Santa Barbara! 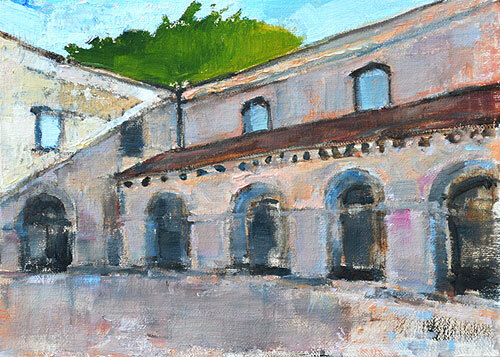 This entry was posted in Landscape Paintings, San Diego Paintings, Urban Landscapes and tagged 5 x 7 inches, arches, architecture, oil on linen on panel, palace grill, san diego, santa barbara, spanish, urban on July 9, 2013 by Kevin. The San Diego Museum of Man and California Tower seen from the Cabrillo Bridge- beautiful historic architecture in Balboa Park. 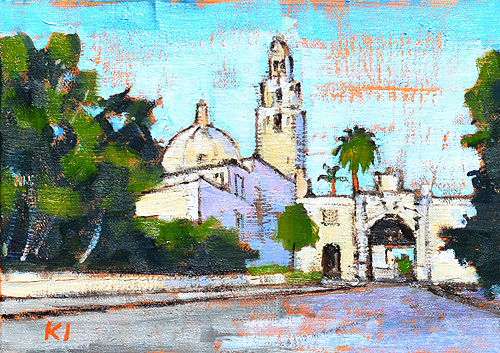 This entry was posted in Landscape Paintings, San Diego Paintings, Urban Landscapes and tagged 5 x 7 inches, architecture, balboa park, baroque, building, cabrillo bridge, california, california tower, colonial, museum of man, oil on linen on panel, san diego, spanish on June 27, 2013 by Kevin. I had jury duty Wednesday and spent my lunch break painting watercolors at a coffee shop downtown. It was a fun, lively place to hang out and paint. This building, formerly a Spanish/ Art Deco power substation, is now the SDSU art museum. 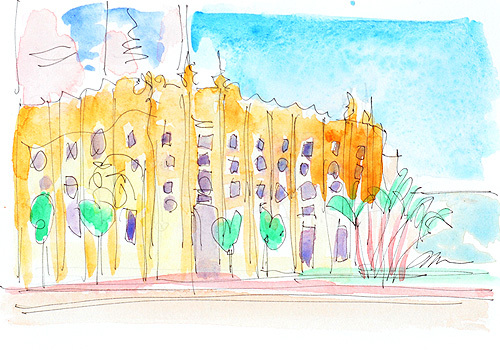 This entry was posted in San Diego Paintings, Urban Landscapes and tagged 5 x 7 inches, architecture, art deco, california, cityscape, landscape, san diego, sdsu art museum, spanish, street, urban, watercolor on June 22, 2013 by Kevin. The graceful Alcazar Garden outside the Mingei Museum in Balboa Park, San Diego. 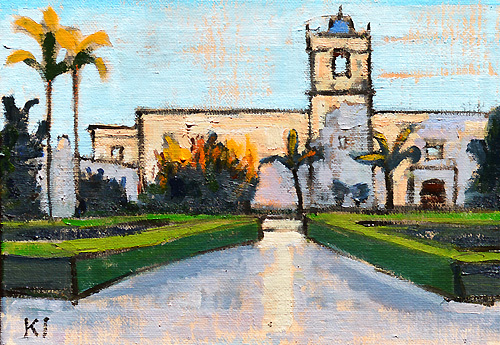 This entry was posted in Landscape Paintings, San Diego Paintings, Urban Landscapes and tagged 5 x 7 inches, acazar garden, architecture, balboa park, baroque, california, formal garden, museum of man, oil on linen on panel, san diego, spanish, tower on June 20, 2013 by Kevin. While I was painting in the patio outside the Museum of Man, my sister’s college friend from the Naval Academy jogged by. Small world! 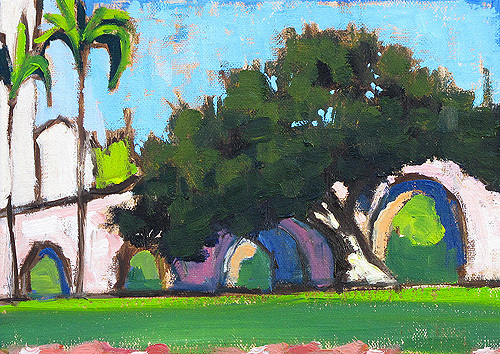 This entry was posted in Landscape Paintings, San Diego Paintings, Urban Landscapes and tagged 5 x 7 inches, balboa park, california, colonial, landscape, museum of man, oil on linen on panel, painting, patio, san diego, spanish on February 25, 2013 by Kevin. Mission revival houses up on a hill- they have great views over North Park. 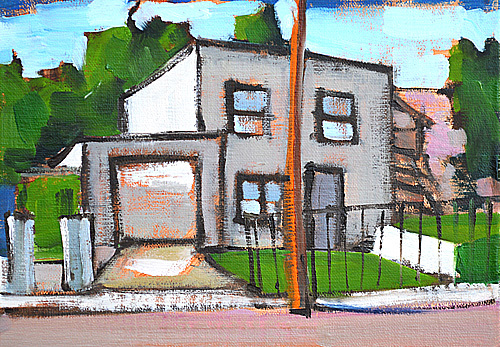 This entry was posted in Urban Landscapes and tagged 5x7 inches, california, houses, landscape, mission, oil on linen on panel, san diego, spanish on August 8, 2012 by Kevin.